Catalin Adam is 15 years old and is the oldest son of Radu and Irina Adam. He has another three younger brothers, also boys, of 16, 6 and 3 years old. 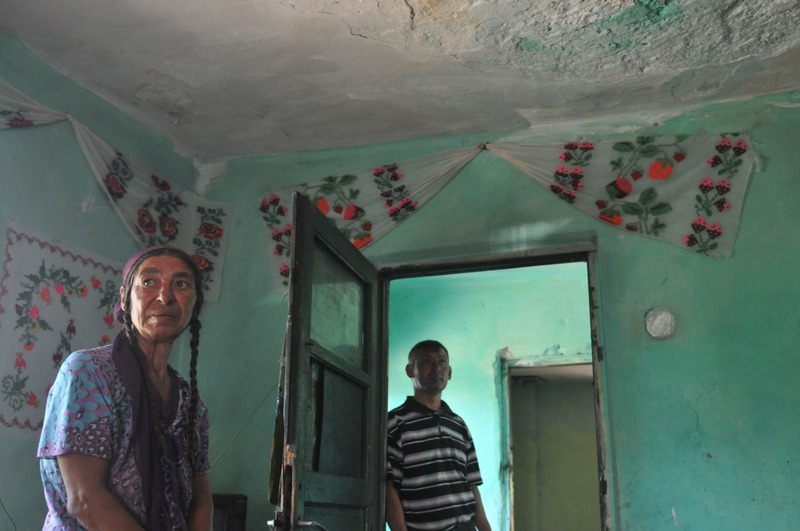 The entire family lives in a two-room house in the village of Piatra Olt. 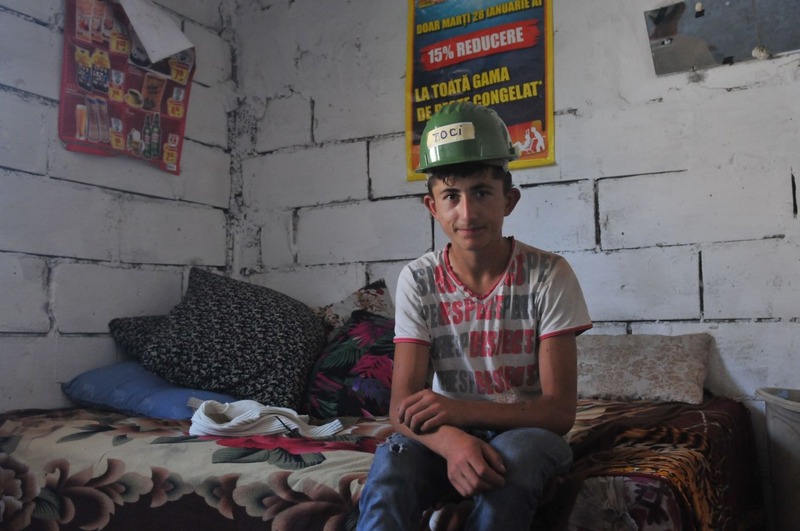 Sitting on a bed covered with a flowered blanket, Catalin tells me that he wishes very much to get the driving license. When he grows older, he wants to become a driver and to have his own car. I ask him if he could write and read, as without this, he could not pass the driving test. Catalin, who is in the 6th grade, studying at the village school, nodes, more or less sure. He can, but not too good. At home, the 15 years old teenager does not have a table to write on. Sometimes, he does his homework on the bed, other times at school. The two beds, are all the furniture of the room There are no storage closets: people keep their clothes in bags, near the beds. There is earth floor and the walls are empty, made of bricks painted white, and covered with posters gathered from supermarkets, displaying ads. of refrigerated fish, coffee and beer. 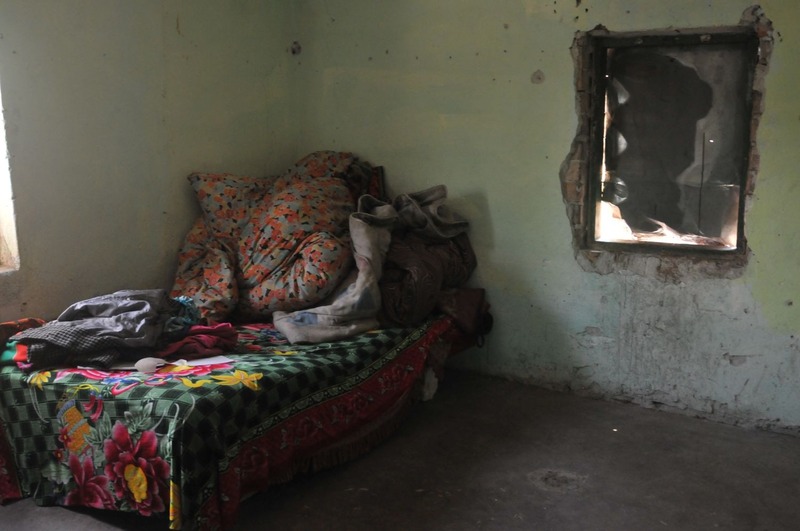 The house is not provided with running water, sewage, kitchen or toilets. 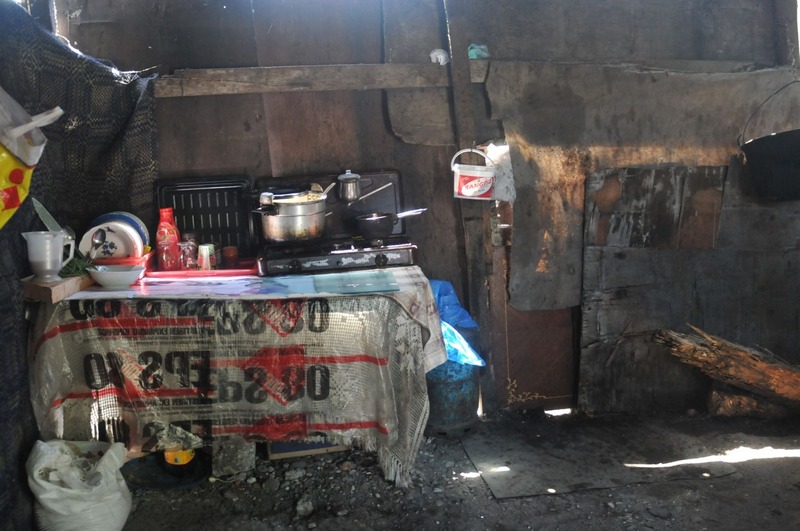 It is hard to imagine that poverty could be harder, but the Adams don’t have a stove. In the summer, they cook outside. 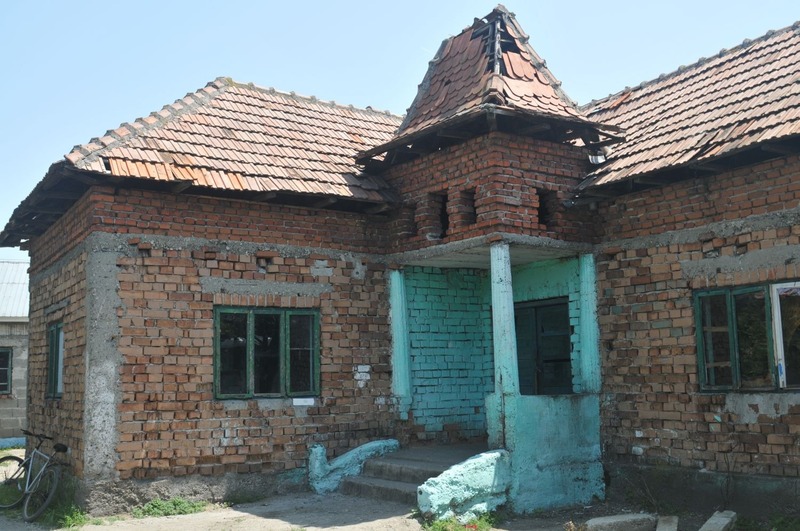 During the winter, in order to get warm, they improvise a ”little brick stove”, as Catalin names it, which gets demolished when the summer comes. The smoke comes out of a hole made in the wall. However, things begin to look better in the Adam family. 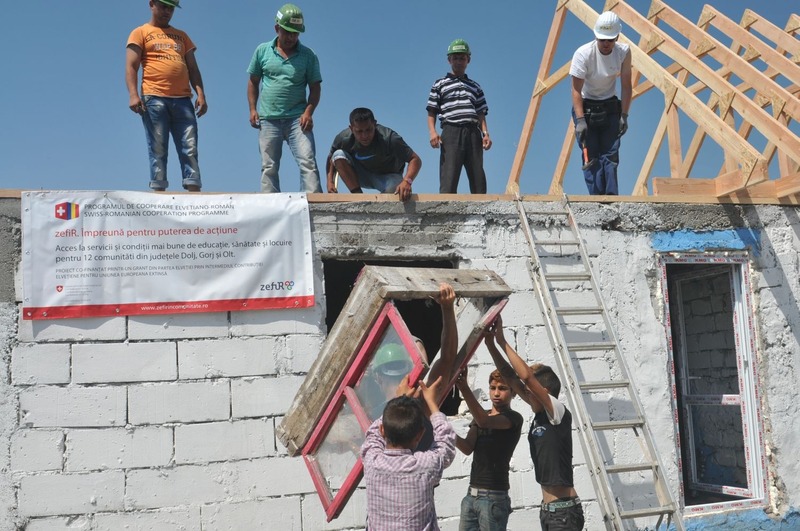 Several volunteers have come to work together with the members of the community in order to renovate their house: they installed double glazing windows and a new door; a wood structure durable roof, which is to be covered with tiles, replaced the old roof, through which the rain used to get in the house. The floor will be covered with cement and the walls insulated. All repairs would have been almost impossible to perform for the family living from social aids and child support. Irina, the boys’ mother, is sick: she was born with a speaking deficiency and it is very hard for her to communicate with people. In families for which every day means a fight to get something to eat, the education or care for health and house often remain at the end of the priority list. These are precisely the problems that the 7 NGOs decided to solve, implementing the project „zefiR”, financed by the Swiss-Romanian Cooperation Program (Terre des Hommes, ”Amare Rromentza” Romani Centre, Pestalozzi Foundation, ”Împreuna” Community Development Agency, PACT Foundation, Habitat for Humanity Romania and Sastipen- Roma Centre for Health Policies). Catalin said that the first thing he thought when he heard that some people would come to repair his house, was to give them a helping hand. Photo: Andreea Dogar. One of the Adam boys admires his new window. Together with him, in the two-room house, live his parents and the three brothers. Photo: Andreea Dogar. 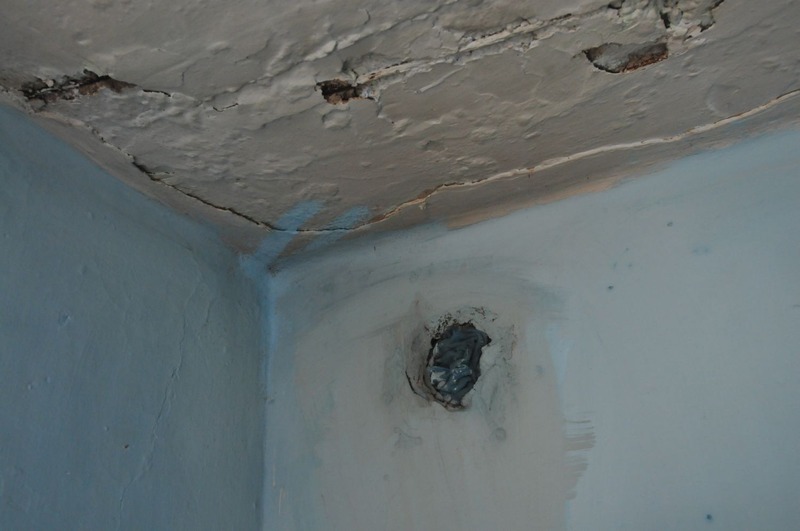 Last week, together with the Adams house, another two houses from the village of Piatra Olt started being repaired. Before finishing the project, 60 families in Piatra Olt will have their houses renovated: from wall insulation to doors, windows, and roof change). The value of the works varies between 700 Swiss francs and 1,500-2,000 Swiss francs for each household. For families living especially on seasonal works and social aid, this amount is huge. 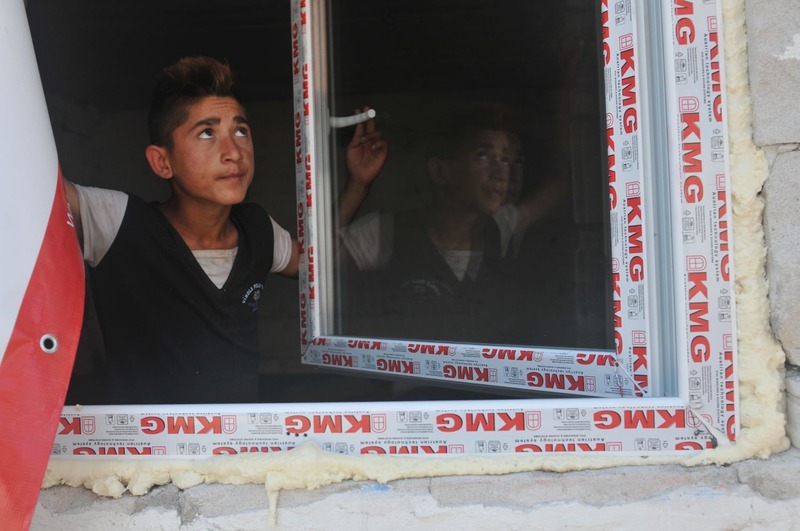 In repairing the house, not only the volunteers of the 7 NGOs involved in the project are working, but also the owners of the houses and the other members of the community. ”The idea is not to build and make people stare. 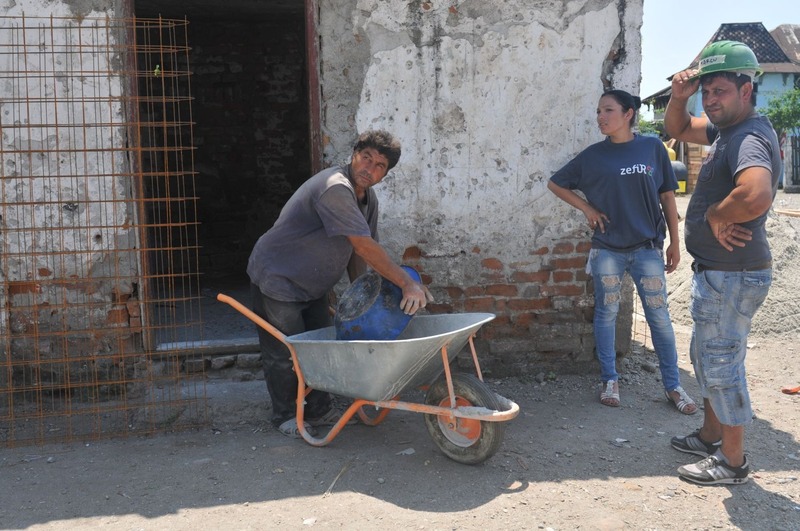 Apart from working for their houses, they will return a percentage from the investment to another poor families in the community, in order to continue the work”, explains Ioana Traista, communication manager of PACT Foundation, NGO part of zefiR project and involved in the communication development. 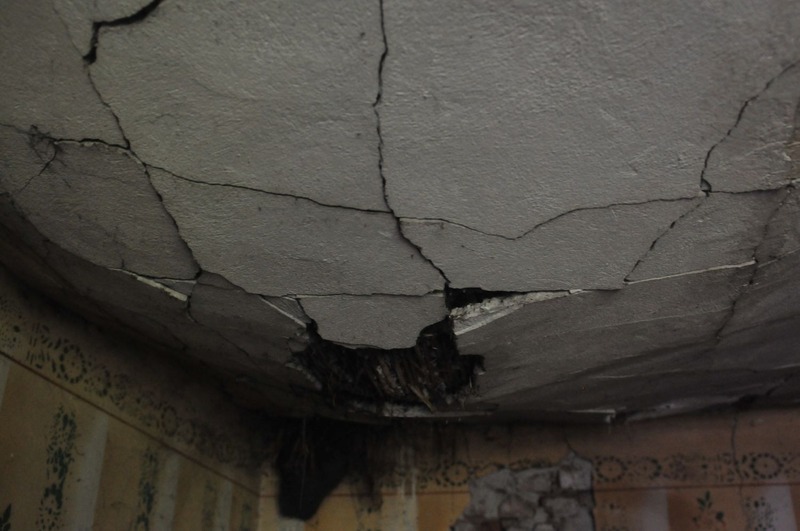 For instance, after a family benefits from renovation, they will contribute with a small amount -5 lei per month, for example-to a fund from which another houses in the locality will be repaired. Also, working together with the volunteers, the people from the community will learn how to build a roof and how to manage it on their own in the future. „ If anything else gets broken in the community, they shall learn how to manage on their own. A lot of the houses are in a state of decay”, Traista shows. 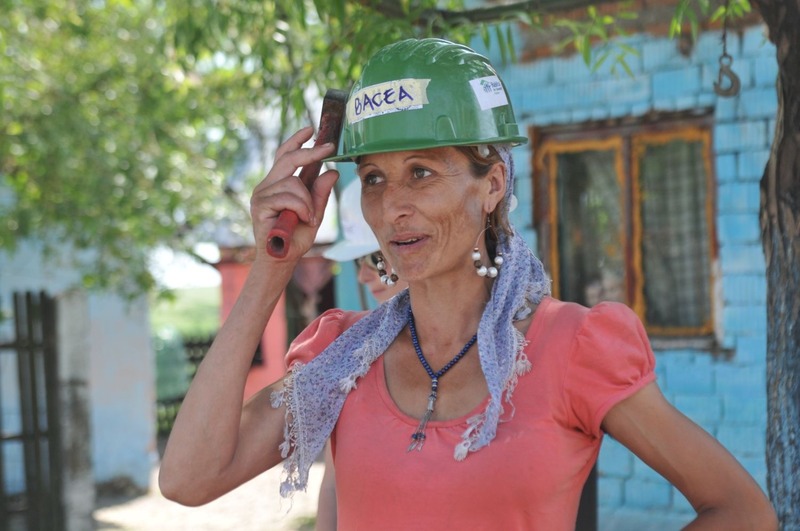 Maria Caldararu hopes that her house will also be renovated. Photo: Andreea Dogar. 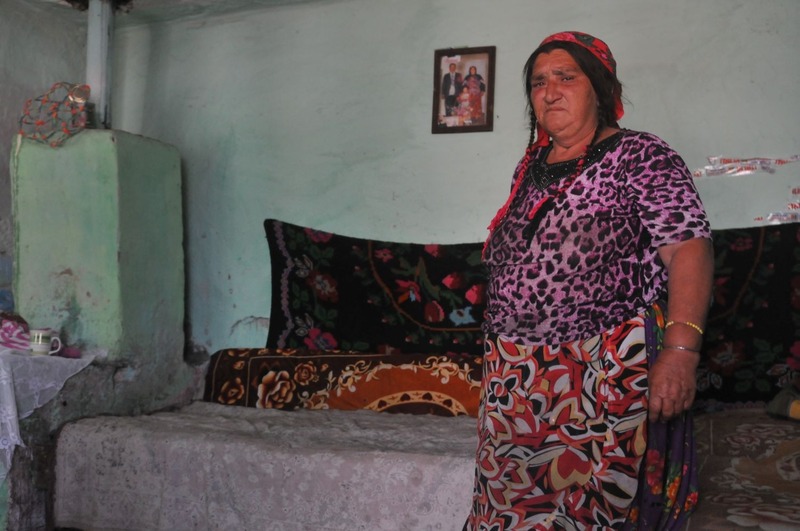 Maria Caldararu’s house is neither isolated, nor plastered. Photo: Andreea Dogar. One of the rooms in Maria Caldararu’s house has a sheet-metal instead of a window. Photo: Andreea Dogar. 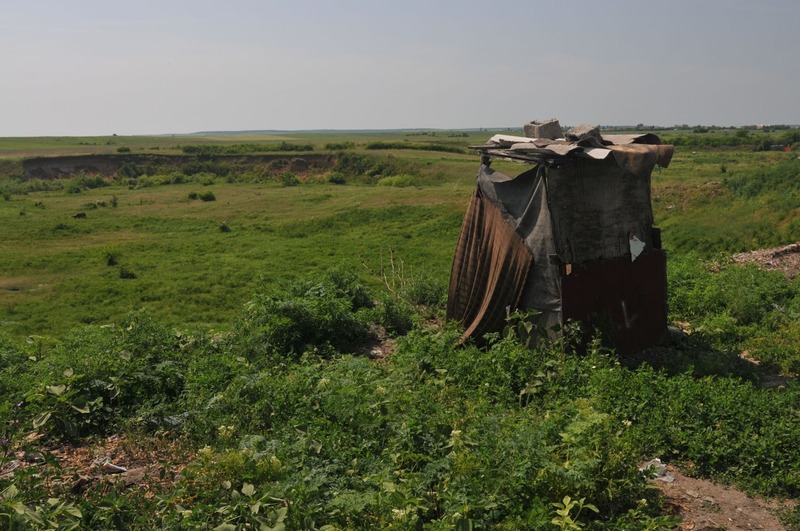 Families in Piatra Olt have the toilets in the back of the house. Photo: Andreea Dogar. The zefiR project, which is mainly founded by a grant from Switzerland, amounting to 3 million Swiss francs, aims to improve people’s lives from 12 localities in the counties of Olt, Dolj and Gorj. The project is oriented towards the children in vulnerable families and tries to offer them access to education, health services and decent houses. In 10 of the 12 localities, there are now ”Afterschool” –type programs, to which children have free access, explains Ionut Raita, coordinator of the zefiR Project, from ”Terre des hommes”, a Swiss organization working in 35 countries and which develops its activity also in Romania, in the field of child protection. Boys in Adam family are removing an old window of the house in which they live. The window was replaced with a double glazing window. Photo: Andreea Dogar. The volunteers are plastering the house of Toma brothers. Photo: Andreea Dogar. 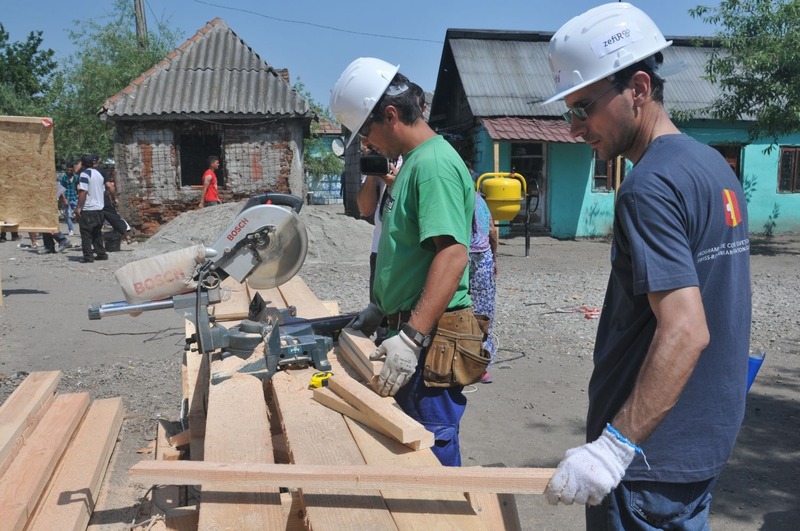 The local people have been coordinated by Habitat for Humanity Romania specialists. Photo: Andreea Dogar. In Piatra Olt, 31 of the 65 children attending the secondary school in the village have been included in the zefiR educational program. Now, the children are attending the Afterschool and participating in many activities part of the project. Children made trips to Craiova Zoo, ”Colibri” puppet theatre and McDonald’s. Most of the children in I-VI grades had never left the community, says Gabriela Paduraru, teacher at the village school. ”it is the first time they left Piatra Olt”. ”At McDonald’s, they behaved immaculately, so the people that were working there made a photo album with them and sent it to us. And they did not expect this, being children from this community. Many wonderful things were done in this two-year period, since zefiR has been here. Especially activities involving children, we wish for them to have a better future. Before zefiR and the initiative group appeared, these kinds of projects have never been performed here. We only performed activities as teachers, connected to our jobs”, the teacher explains. Children who come at the afterschool also receive a meal: ”We can already see the results in children. At the beginning, they barely knew the letters. Now, they are able to read, write and calculate”. Together with the teachers, the children arranged the houses, painted the walls and participated to sports activities, environmental protection activities, health activities or practical workshops, during which they created different objects. ”We made fruit salad: we bought fruits and made it in the class. The initiative group bought toothbrushes, toothpaste and soap for the 31 children”, says the teacher. 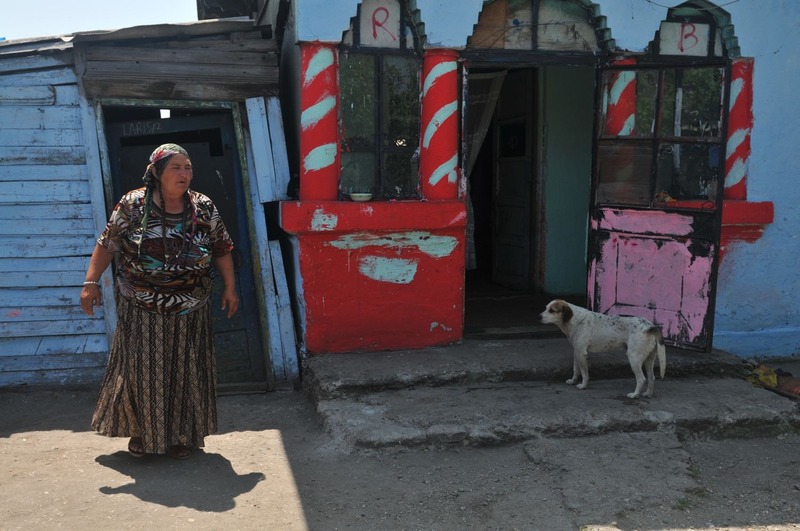 The Roma community in the village of Piatra, county of Olt is very poor. Photo: Andreea Dogar. 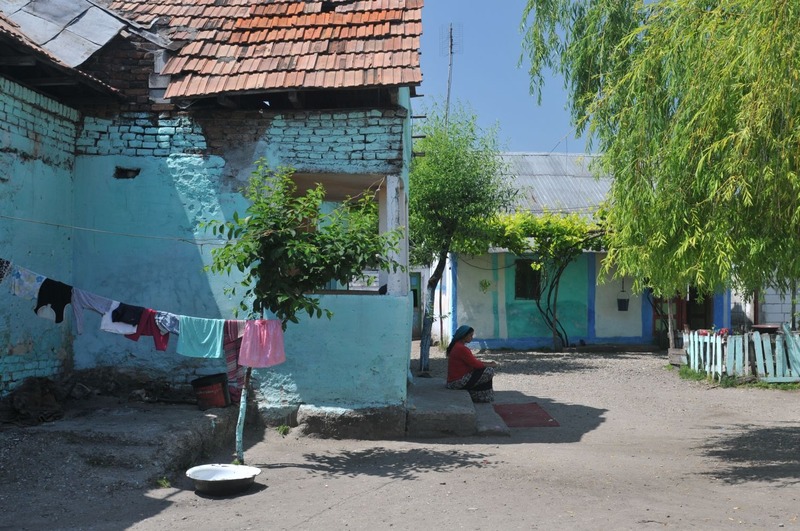 In the zefiR project, the houses of 60 families in Piatra will be renovated. Photo: Andreea Dogar. Adams’ house will have a new roof. Photo: Andreea Dogar. 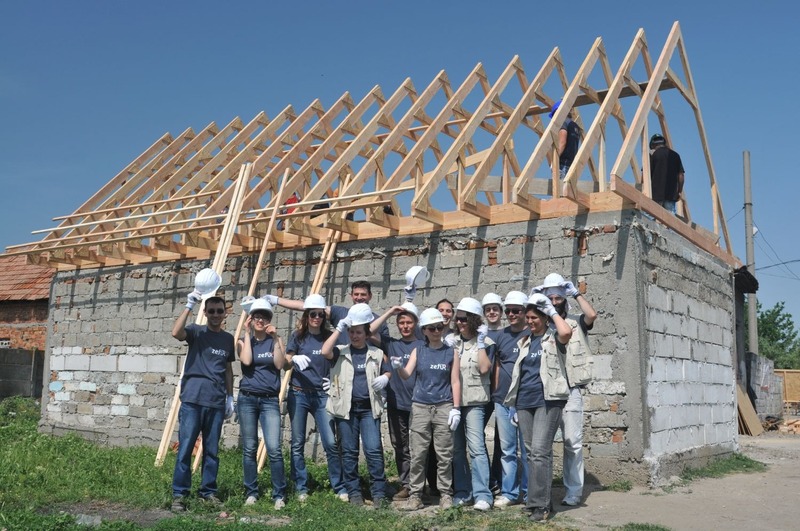 The volunteers and the local people in Piatra are working at the roof of Adam family. Photo: Andreea Dogar. One of the biggest successes of the teacher involved in the zefiR project is that now the children are coming in a greater number at school: “When I got this job in 2007, I had a group of 7 children. Now, I have 65. There are no unregistered children. In the registrations period, they are coming and I call them to register. All of them are registered, both at preparatory and 1st grade. We have meetings with the parents twice a month and they really answer and stand by them”. One of the purpose of the zefiR project is to teach people to become more independent and to solve the problems on their own. For this reason, in each of the 12 localities involved in the project, an initiative project was founded with members in the community, in order to prioritize the problems in the area and to put pressure on authorities in order to solve them. Also as part of the zefiR project, the Children Council of the Piatra Olt city was created (to which the village Piatra Olt also belongs), composed of 9th -12th grades pupils, from the Piatra Olt Technological High School, Roma and Non-Roma. On Christmas, the high school students played a charitable football match, to which they invited the representatives of the City Hall of the High School, of the museum and of the City Library. With the 360 LEI they raised from the tickets, the organizers bought candies for the poor children in Piatra Olt. The brothers Iulica and Ion Toma live in the house in the photo. The ceiling, the floor, the doors and windows will be restored and the walls of the house will be plastered inside and out so that the cold won’t get in. Photo: Andreea Dogar. 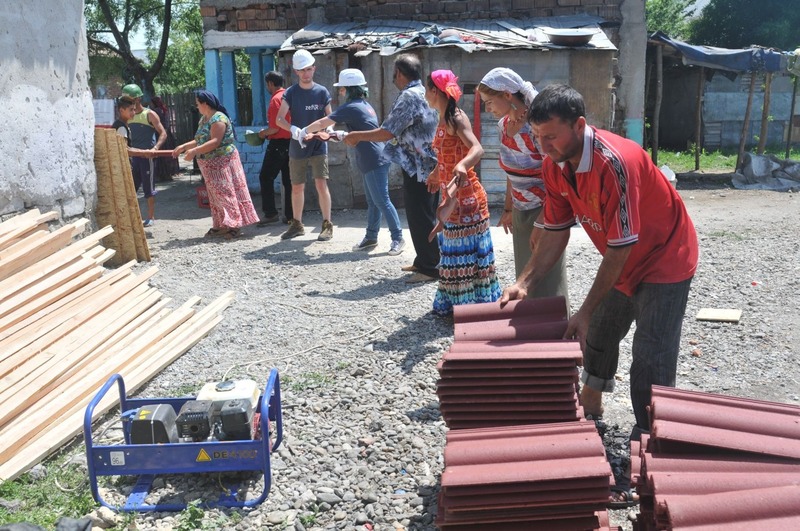 The locals of Piatra worked with the volunteers to renovate the houses in the community. Photo: Andreea Dogar. “Diminishing social disparity means fighting against exclusion. Decent housing is very important in the fight against exclusion. 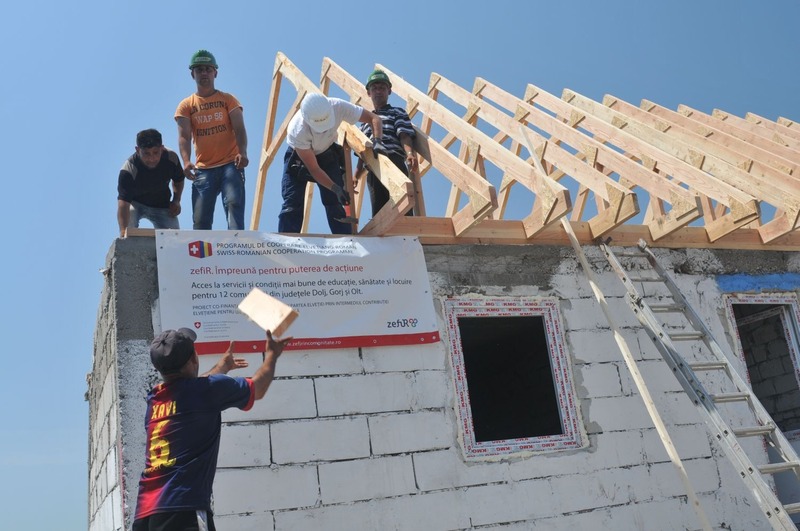 This program (The Swiss-Romanian Program of Cooperation) intends to offer housing to all vulnerable persons in Romania. The areas with the greatest necessities have been identified”, explains Marc Bruchez, Deputy Ambassador of Switzerland in Romania. In order to have access to education and to be healthy, the quality of the house is of the utmost importance: a child who doesn’t have a place to do their homework or who comes to school soaked because the rain infiltrates inside their house cannot obtain good results at school. Danimelca Adam pointed to a wall of the house which cracked from top to bottom. Photo: Andreea Dogar. The people of Piatra have no kitchens inside the houses. Most often, the kitchens are some sort of barracks put together from boards and wood. Photo: Andreea Dogar. In the three room house of Danimelca Adam live 6 people. Photo: Andreea Dogar. For this very reason, houses are also renovated within the zefiR project, in 5 of the 12 localities included in the project. 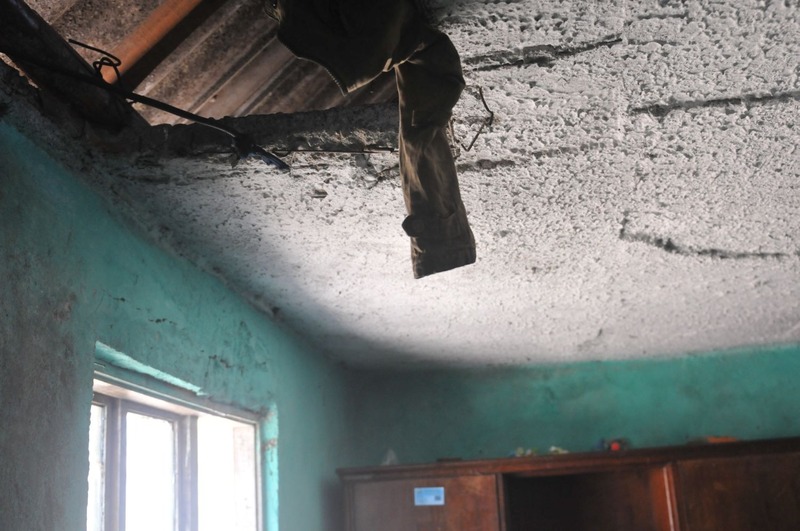 In total, 270 families in the five communities will be beneficiaries of house repairs. The renovation works are coordinated by the organization Habitat for Humanity Romania, whose mission is eradicating poor housing. 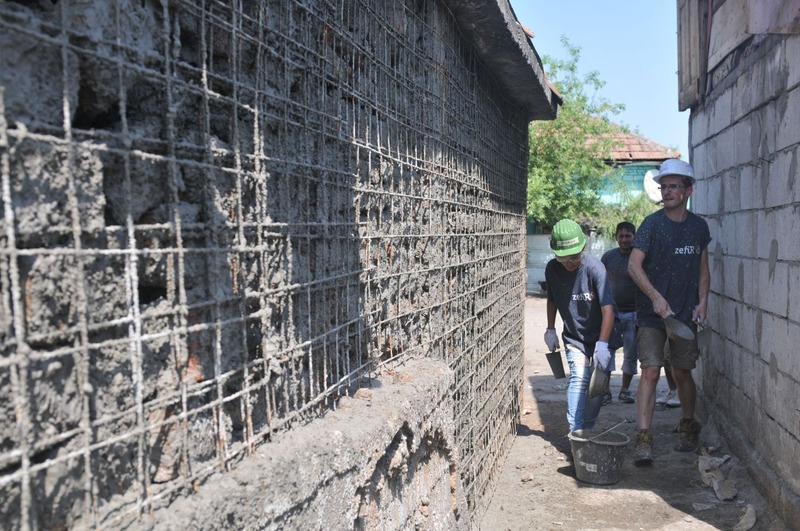 The volunteers and the specialists of the organization perform the works on the site, but the community members participate as well: they carry tiles, hammer nails or plaster the walls. “We will work together with 60 families. They are already working. The people express great interest in improving their living conditions. The biggest problem is that living conditions are not treated as a priority. 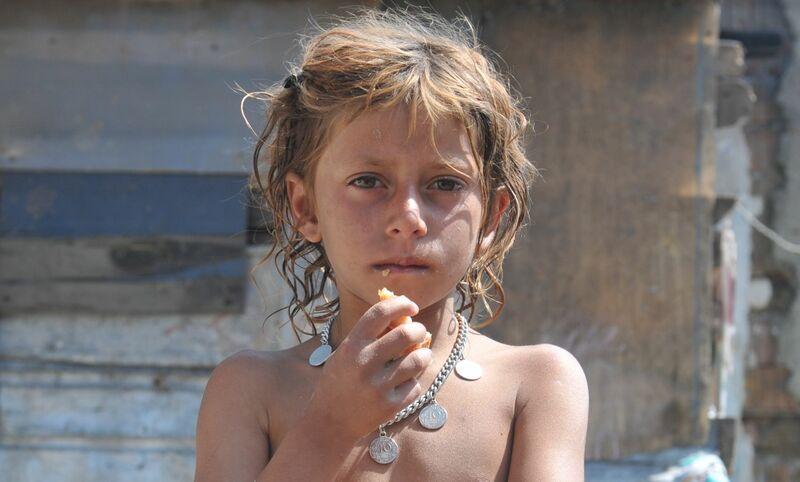 There is no country-level or EU-level program for the poorest among us. This is why we thank the Swiss fund. It’s a drop in an ocean”, states Zamfir Todor, Project Manager of Habitat for Humanity Romania. In the village of Piatra Olt, many of the roofs of the houses are made of asbestos, a material which was proven as being carcinogenic and whose usage has been banned in the European Union for several years, although the interdiction did not target the removal of the asbestos which was already incorporated in various buildings. 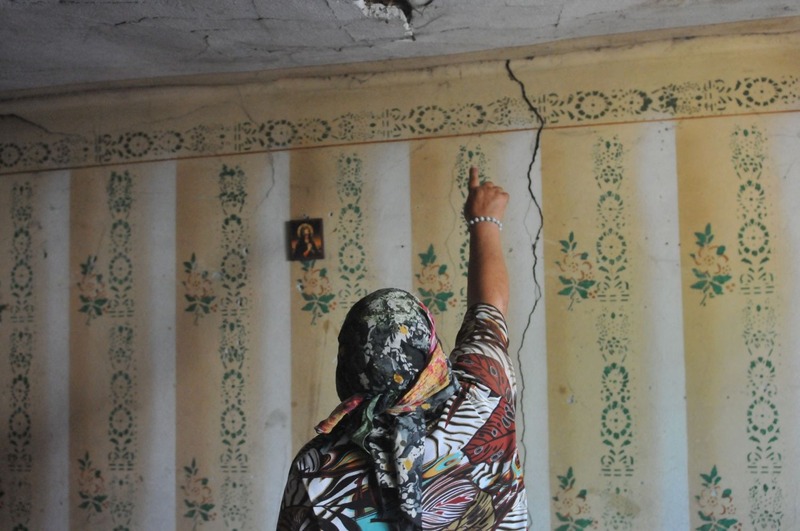 Margareta Pompei is 63 years old and hopes that her house will enter the rehabilitation program: the roof of the house is rotten and is about to fall off, the wooden entrance door is broken and 6 persons live in the two rooms (herself, her daughter-in-law and 4 children). 12 years have passed since her husband died, her son has mental issues and isn’t at home much, so she and her young daughter-in-law, Nadia, must handle everything themselves. When winter passed, the house was black with soot. They whitewashed it on Easter and covered the whole in the wall with a rag, so that “the snakes wouldn’t get in”. In order to heat the house over the winter, the Pompei family lit a fire in a tin barrel, indoors, and drilled a hole in the wall through which the smoke would be evacuated. Photo: Andreea Dogar. Three community centres of medical and social assistance were also founded through the zefiR project, one for each county. In every centre, the locals can find a sanitary intermediary (who connects the members of the community and the medical personnel), a community nurse, a doctor and a centre coordinator. Everyone works part-time and the centre is open from 9:00 to 17:00. The centres are focused on increasing the access to quality services of pregnant women, nursing mothers and children, but they provide services for other people as well, explains Raita. The centres provide counselling and medical information for the locals (which documents they need to register at the doctor’s office, nutrition information, health information, information on the effects of tobacco, on contraception, diabetes prevention, correct nursing). “They urge them to go register at the doctor’s office, to talk with the doctor, they see that the child is vaccinated and that they get powdered milk through governmental programs if they have nursing issues”, Raita adds. After the project will be finished, the coordinator hopes that the local authorities will take over the financing of the three centres, at least regarding a part of the paid personnel. 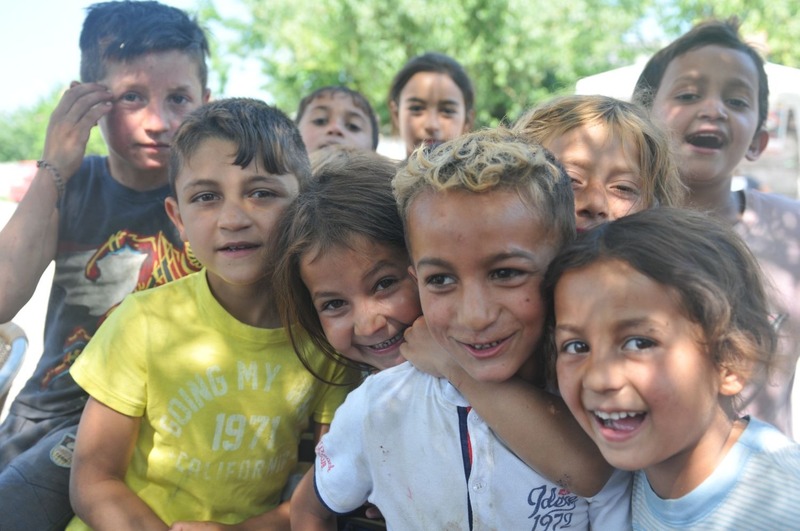 The children in Piatra amuse themselves before the camera. Photo: Andreea Dogar. Through the Afterschool program within zefiR, the children of Piatra are encouraged to come to school and to care about education. “So that they may have a different future”, states teacher Gabriela Paduraru. Photo: Andreea Dogar. Most of the residents of Piatra survive from social aids and from seasonal work. If they have access to education and they don’t drop out from school, the children of Piatra may have a different future. The article was published in the online magazine GreatNews, on 25th of May.